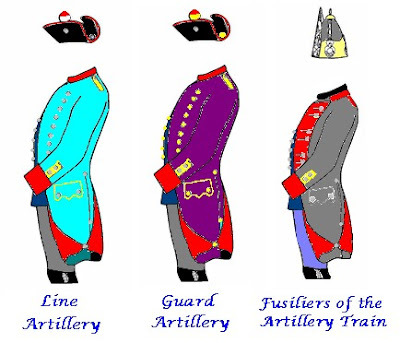 The artillery of the line regiments follows the Prussian pattern uniform in the standard light blue of the line infantry, with the infantry Prussian blue weskit. All buttons are in pewter. The Guard follows the concept in wearing the same cut of uniform in the Guards purple with brass buttons. All gunners wear dark gray breeches. Hetzenberg's ordnance is composed of 3 pdr guns attached to the line infantry regiments. At the moment I'm toying with the idea of having a single Guards battery of 12 pdr guns instead of assigning regimental guns so the Brigade will have a heavy punch. The Fusiliers of the artillery train are the oldest fusilier regiment in the army. Their uniform coat is in the color scheme worn by the artillery up to 1740 in which year light blue was adopted. The Fusiliers and the drivers of the Train retain the gray, although as can be seen the Fusiliers were persuaded to adopt the line infantry's mid-blue breeches and Prussian blue weskit. Extremely *logical*, including the 'traditionalist' complication added by the very special case of the Fusiliers of the Artillery Train! I suppose mounted drivers wear buckskin breeches? If your Guard battery eventually fields more than a single model, one of them could be a heavy howitzer crewed by Bombardiers with mitre: they were seen as 'the Grenadiers of the Artillery', so it would be fitting to have them in the Guard? Good point! I like the idea of a Guards heavy battery even more, so I'm going to form one.